I work on a Reward Basis... That means you pay me what my service is worth to you and what you can afford for me to come out and find your lost item. There will be a $25 dollar call out fee to cover my gas expense if the item isn't found. It may be more or less depending on where you are located and thank you for this consideration. A portion of any reward will be donated to the Alzheimer’s Society. Old Homesteads/Fields, Beaches(up to 5 feet of water) Yards/Gardens, Wooded Trails, Parks, Researching/Finding Unknown Historical Sites/donating the finds to local museums. I retired from business in 2014. 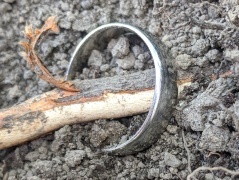 I've been metal detecting on and off since 1987 and really enjoy the hobby and now I am able to pursue my hobby full time and most of all, looking forward to helping you find what you thought was lost forever. After a couple of hours of yard cleanup and gardening I was distraught to discover that my wedding band was missing from my finger. It is not a particularly fancy or old ring but it has been with me for the past nearly 11 years, is as well traveled as I am and looks the part. Needless to say I was upset and began frantically sifting through dirt and pulling up my recent plantings in the hopes of spotting it just below the surface. Regardless of the gallant effort put forth the only reward for my panicked searching was a nasty sun burn and a sense of failure. About this time my very understanding wife, between her words of encouragement and understanding, suggested we get a metal detector. Quickly we realized we have no idea how to use a metal detector and she set off to find someone who could. Soon we happened upon the ring finders website and easily found Ron in our area. He returned our call with lightning speed, on a holiday Monday no less, and agreed to come by to search that very same day. Not 10 minutes after the search began my ring was back on my finger and quickly left indoors where it would be safe for the remainder of the yard work. Ron was extremely professional and polite. His services will always come highly recommended. Save yourself the sunburn and call your local ring finder!